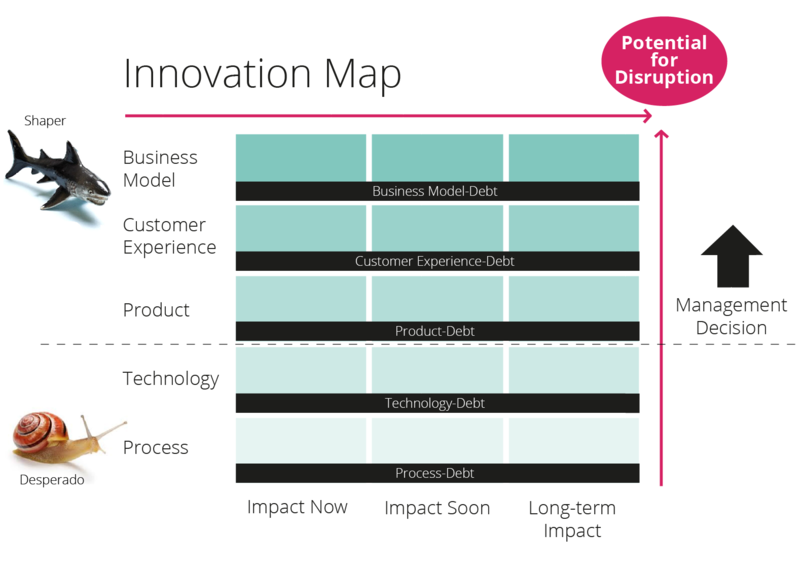 If a company or organization don’t work continuously and strategically with innovation on all these areas, process, technology, product, customer experience and business model, they are causing debt. I have added it to the map to help and bring clarity around what levels there is debt today, and where it could be in the future. 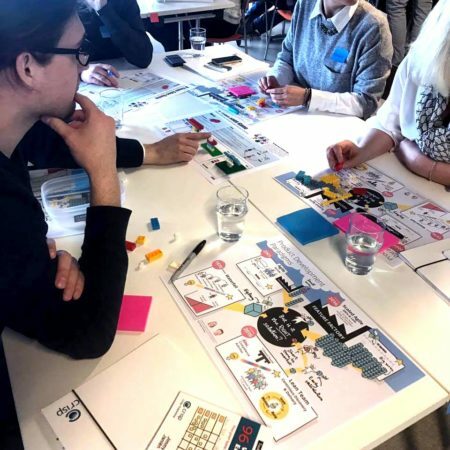 Sometimes you can take a business decision delivering something that creates debt, but if the organization never prioritize to remove that debt they can not stay innovative or scale their business. Many organizations that I meet today suffer from debt on all levels giving long lead times on delivering business and customer value as well as low quality in customer experience. In that situation they are becoming a desperado (snail) and new faster and more innovative companies, shapers (sharks) will come and take over their customers with their new services and products that are more attractive. If you use the innovation map and collaborate around it there might be a good idea to keep it somewhere in a printed format where every one sees it, and keep it updated! Take a look back and see how you are doing on a regular basis together with the organisation, work hypothesis-driven when needed and validate your assumptions, the higher up in the map you are, the more important it might be to have an Agile mindset. By doing that you can probe, sense and respond to new learnings and ideas as you move along making sure you don’t run in the wrong direction and just deliver on the plan without actually measuring outcome. There are actually 4 different innovation strategies even though I only use the two furthest apart in the innovation map. The Shaper is someone who is shaping new markets, leaving the competitors behind. The use of provocative thinking is natural for these companies. The Competitor are those who follows the Shaper and tries to do what the Shaper has already succeeded with. The Improver is not interested in doing big changes, they improve what they already have. They might soon become a Desperado. The Desperado is the opposite from a Shaper. They must do something radical, or they wont exist as a company any more. Their strategy is usually to cutting costs.